In Sikh history Mata Sahib Kaur is known as the Mother of the Khalsa. This honour was bestowed upon her by the Tenth Nanak, Guru Gobind Singh Ji. When a Sikh receives the gift of Khande Dee Pauhul (Amrit), he/she is told that from today onward your father is Guru Gobind Singh Ji and you mother is Mata Sahib Kaur Ji. 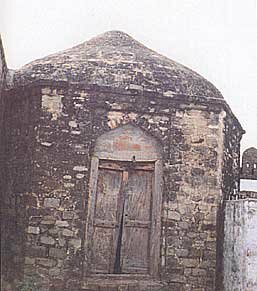 Mata Sahib Kaur Ji, whose name before taking Amrit was Mata Sahib Devan Ji, was born on the 1st November 1681 in a village called Rohtas, District Jehlum, in West Panjab, (now in Pakistan). Her mother’s name was Mata Jasdevi Ji and father’s name was Bhai Rama Ji. 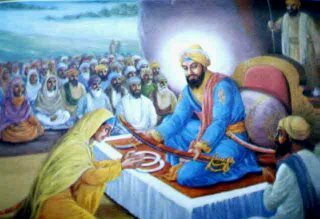 Her father, who was an ardent sewak (devotee) of Guru Gobind Singh Ji, influenced her to the extent that she wanted to devote her whole life in the service of the Guru Sahib. From her childhood, Mata Sahib Kaur Ji was a sweet and quiet natured girl. Because of the religious atmosphere at home, she was deeply influenced by Gurbaani during her formative years. 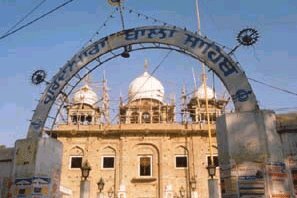 It is possible that in her childhood she might have seen Guru Gobind Singh Ji at Sri Anandpur Sahib during the visit of her family. 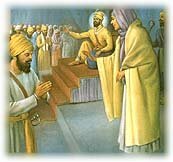 Mata Ji guided the Khalsa Panth through period of crisis many times and issued eight decrees in the name of Khalsa. Fateh is victory, my Khalsa will fight for Waheguru's victory. O Mata Jee, when I see one Khalsa with these 4 qualities I see all four sons. Dhan Dhan Mata Sahib Kaur jee! Thanks for this valuable information.Please spread it as much as possible for their are many ignorant fools like me who thought that our guru had more than one wife.